I have been doing some experiments with Eclipse EASE in preparation for determining the suitability – and creating a prototype – of using EASE with non-JVM scripting languages, in particular Python (CPython specifically). To achieve this end goal I am working on a new module, /System/Launch, to allow me to explore that functionality. As a practical goal I am trying to use EASE to solve a long term problem of how to launch more complicated systems, especially those that run out of steam with the Launch Groups. For instance, multiple launches for debugging a multi-core system (especially with customizations and interdependencies) or parametrization of job launches. The Launch Module is a new module under consideration for EASE (Bug 478397). Its key method is the “launch” method which takes a Launch Configuration Name and an optional Launch Mode. The method then loads the named launch configuration and launches it, finally returning an ILaunch to allow future interaction with. By using the launch method multiple times, with some additional control around it, allows complex launch sequences to be created. Create three launch configurations named as above. Open the scripts in “Launch Module Examples” folder. Alternatively paste the lines from the examples into the Rhino Script Shell console (as in the screenshot above). You get auto-completion of the names of the launch configurations and the launch modes too! In this first example, we simply launch the Client in Debug mode. Line 1: load the Launch module, this populates the namespace with all the methods defined in the Launch module. Line 3: launch the existing launch configuration “Client” in debug mode. In this example, we prepare our environment with the “Prepare” configuration, then launch the “Server” and “Client” configurations. Example 1 and 2 are a promising start, but do not yet add any new functionality to Eclipse. So what do you do if you want the server to stop automatically when you finish debugging your client. Well that is really easy now, just monitor the client launch and terminate the server. This is a screenshot that shows what the Debug View looks like when we are busy-waiting on line 12. At the top is the EASE Script launch of the example. Then is the now terminated Prepare launch. Followed by the still running Server in Run mode. 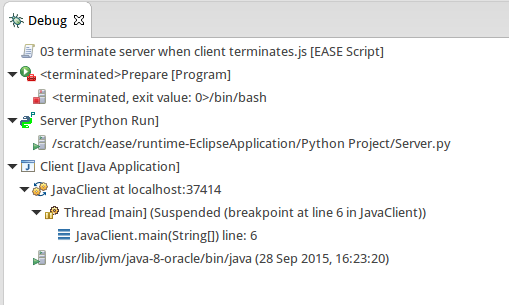 And finally, the Java Client, in Debug mode stopped at a breakpoint in main. With the full power of the scripting language you can take these examples to the next step. A good place to start would be to remove the 3 second delay on Line 9 and replace that with some logic that actually determines if the server is ready to accept connections. Returns an array of all the Launch Configuration Names known to the Launch Manager. These names can be used as the argument to the getLaunchConfiguration, launch and launchUI methods. Returns an array of all the Launch Configurations known to the Launch Manager. These can be used as the argument to launch and launchUI methods. Return the launch configuration given by name parameter. The launch configuration can be edited or otherwise operated on. See ILaunchConfiguration.getWorkingCopy(). Launch the configuration either given by name or a launch configuration and return the ILaunch for further processing. This is the way to launch a configuration within a script which is itself launched. Launch the configuration in the UI thread. This method respects the workspace settings for things like building before launching. Obtain the platform launch manager. 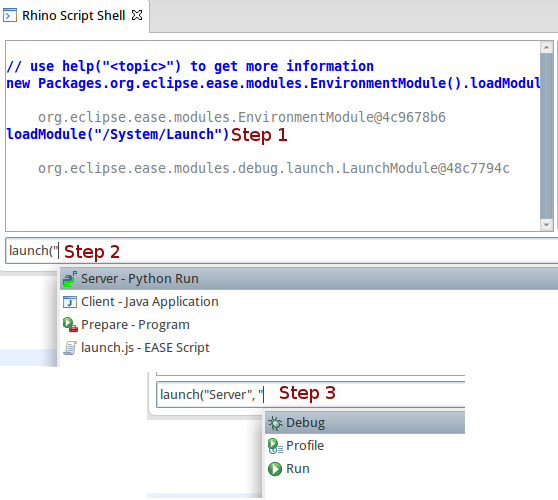 This allows access to the Eclipse debug core launch manager, allowing control over all non-UI aspects of launches. The most valuable of these should be wrapped for ideal script usage and made available in the module itself. 2. Additional UI functionality is within the DebugUITools class, enabling access to this class directly from within the launch module is an option. Additionally, a Debug module would be very useful.